These boxed power supplies are normally used when power is being taken to the camera's from another way, not by the same way as the camera signal. These boxed power supply looks a lot nicer and neater than a load of cable being messy and they are more professional quality. Plus with using a boxed PSU it means that it can be wall mounted. This boxed PSU has the capbility to support 9 CCTV cameras. Individual LED power indication, the red light shorts indicator helps you know which camera is not working. 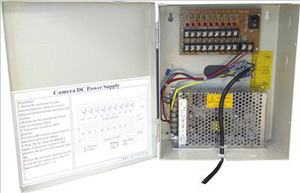 You are able to lock this PSU so no-one can tramper or mess about with your power supply to your CCTV Cameras. This PSU comes with a set of two keys which you use to access the lock of the front of the PSU.